Did you know that on my mom’s side, I’m a dairyman and nurse’s granddaughter? Clearly, nurses have loved farmers in my family before! 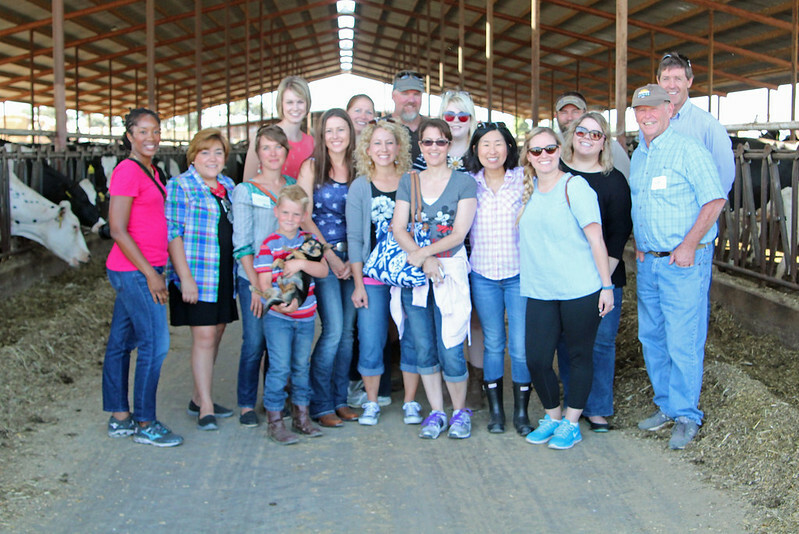 I was thrilled when our Best Food Facts TASTE blogger group headed to another “nurse loves farmer” farm in Galt, California to New Hope Dairy. Arlin Van Groningen is married to an NICU nurse named Apryl, and she came over and introduced herself to me as soon as our tour on their farm started. It never ceases to amaze me how well nurses and farmers go together, just a personal observation! They’re raising their four children right on the dairy farm and Arlin’s business partner and dairyman, Arlan Van Leeuwen, lives about an hour away from the dairy. Does Large Farm = “Factory Farm”? One thing that really came to the forefront of my mind while touring their large dairy farm, where they milk 1200+ cows, is that even though they have 3 big open barns, and milk their cows from about 3:00 AM to about 1:30 PM for the first milking, they are still very much a family farm, as are 99% of the dairies in California. One thing that I come across time and time again with consumers in social media interactions is the concept that big farm = bad, and small farm = good. 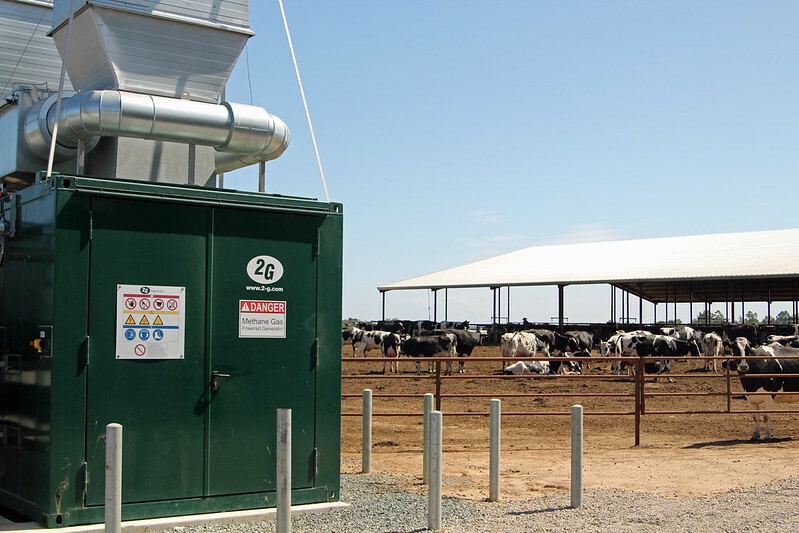 Often large farms are thought of as “factory farms“, and such just isn’t the case. There are real families like Arlin’s running the operation and managing the business. On the day of our tour Arlin told us he was up at 4:30 to start work. 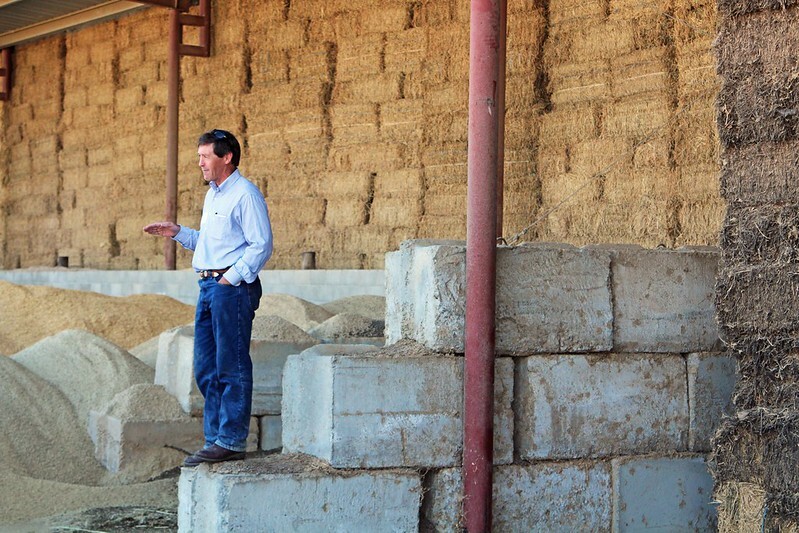 That is diligence, and I applaud all dairy farm families on the commitment and dedication they show to the industry. 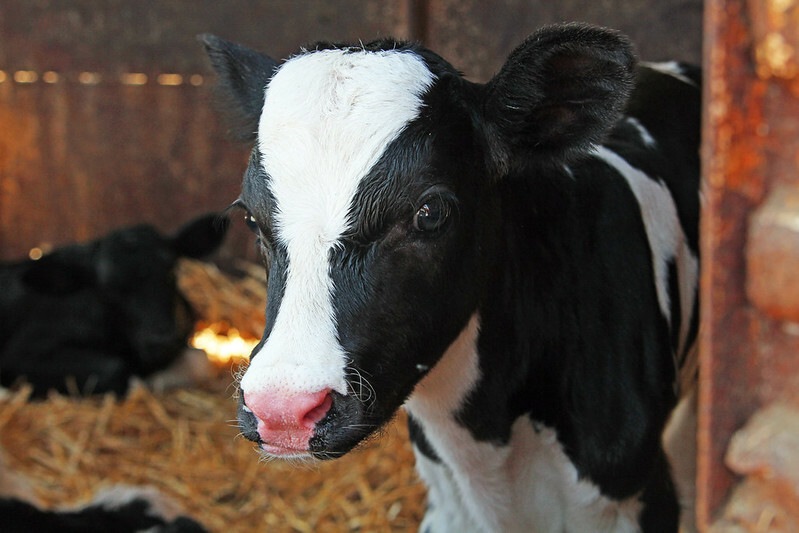 No matter if a farm has 20, 200, or 2000 cows, it is up to the farmer(s) to provide quality care for their animals. Animal welfare can be an issue at any farm and size doesn’t matter. One of the Van Gronigen children playfully pushes feed towards the cows. 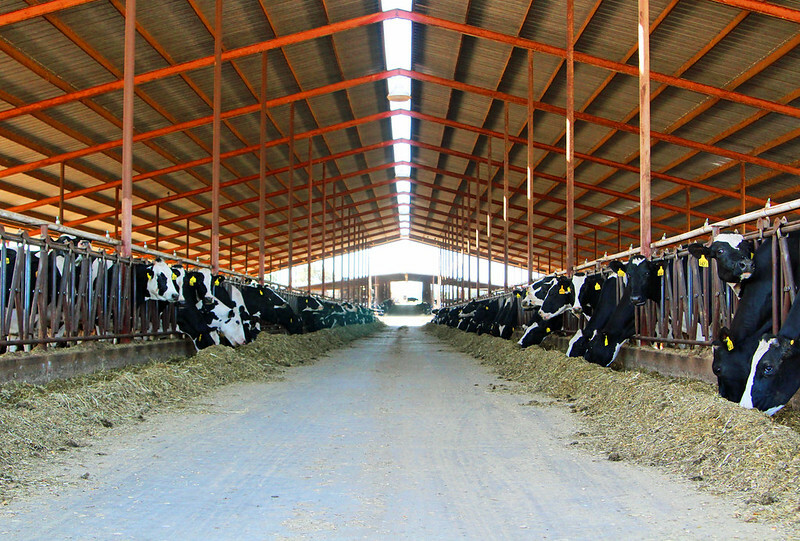 New statistics for American dairy farming were released not long ago and the average size dairy in the US is 204 cows. 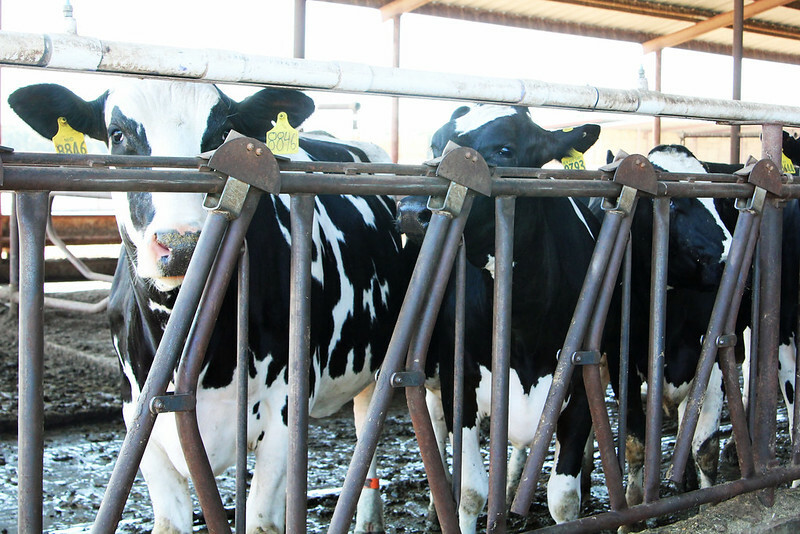 California produces the most milk in the US by a landslide at 42,337 million pounds. 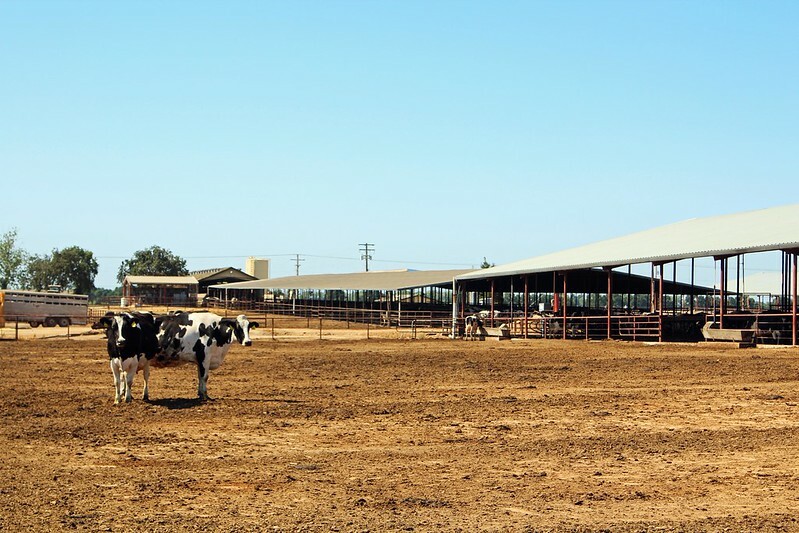 There are 1485 licensed dairy herds in California and the average size of herd is 1199, so New Hope Dairy is right on the average for size in California. I want to remind you that we don’t have any livestock on our farm — just crops. I’m still very much a city girl in the fact that, if I’m being transparent, I think farm animals are smelly and gross. 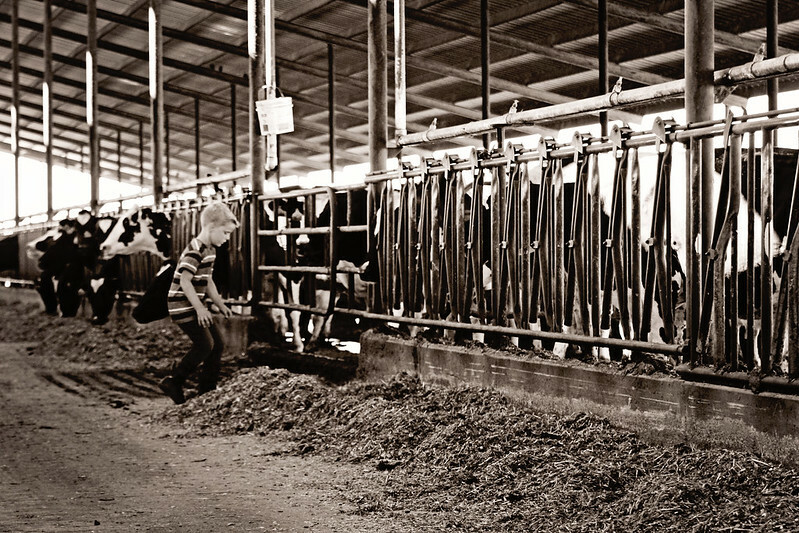 Don’t get me wrong, I am a big supporter and consumer of animal agriculture products, but I used to walk around on farm field trips as a kid with my fingers plugging my nose…and not too much has changed, it’s the honest truth! One thing I noticed right away at New Hope Dairy was how much it didn’t smell. Later on our tour we would find out why. 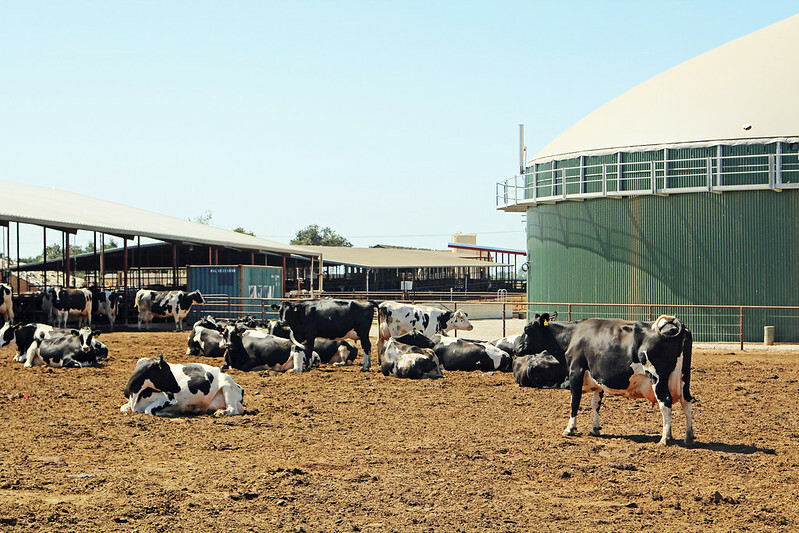 The farm has a digester tank (the green tank two pictures above), that holds 1 million gallons and harvests biogas in the form of electricity — enough to provide power to 250 homes, or 450 kW of electricity. This is 1 of only 200 digesters in the entire country. They sell the solid waste to local farmers and also use it on their fields — it really is a full circle operation and a great sustainability practice. 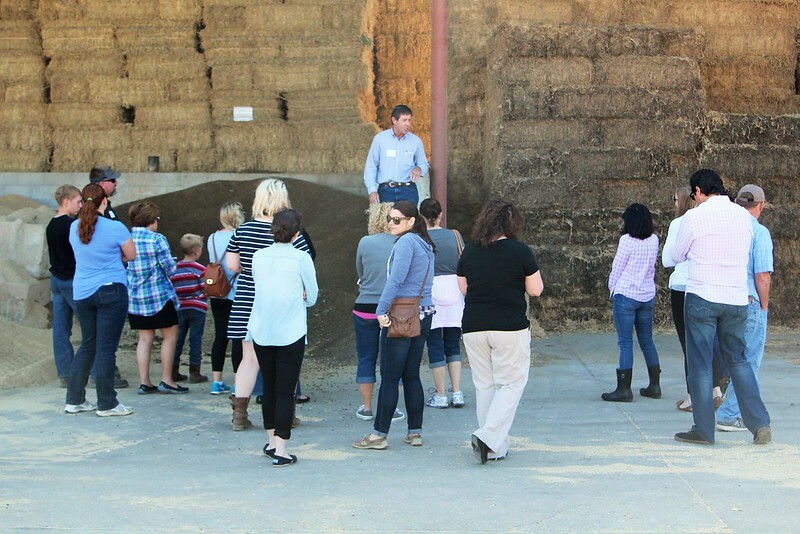 We started off our tour with a talk from the farm’s nutritionist John Kennedy. A nutritionist for cows? That’s why there is such a science, and even an art, to modern agriculture. Gone are the days of using pitchforks to ration out feed for cows. They need a balanced diet with the proper amount of nutrients like us. I appreciated the transparency of John and Arlin when it came to the use, or in their case, not using rBST (a synthetic protein used to boost milk production for dairy cows). It’s illegal to use in Canada, but perfectly legal to use in the United States. The men at New Hope were honest that they would like to use rBST for some cows, when indicated, but they know that consumers are leery of rBST in their milk and the cooperative that New Hope Dairy sells their milk to does not allow for the use of rBST. I truly did love all of our tour, but my favourite part was visiting the new babies. 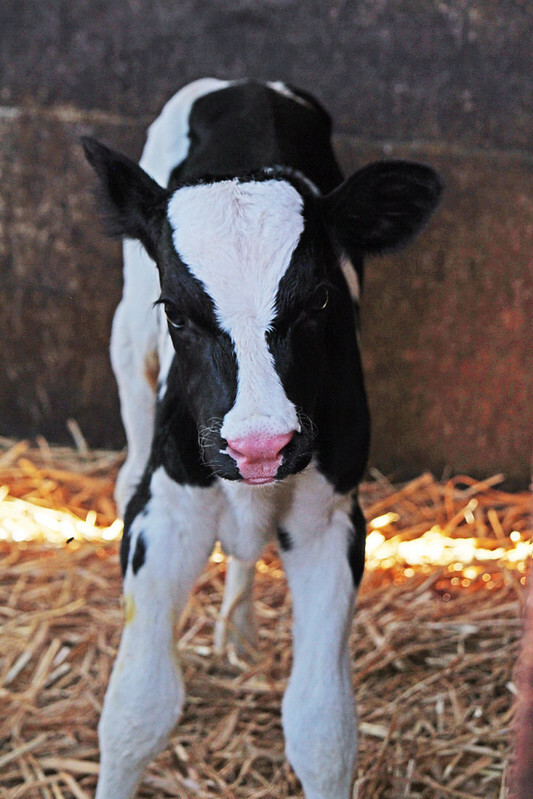 I want a Holstein calf, I always have! Look at her little pink nose and perfect face? My grandparents used to have Holsteins and I grew up with a Holstein-themed kitchen because my mom loved them too. I also got to meet a girl who has quickly become one of my best friends. Together we, along with a couple of others, formed Ask the Farmers and we chat every single day. So happy to meet Krista, The Farmer’s Wifee! Our group was an absolute blast and I’m excited to connect with them again in Chicago at the end of July for the second part of our program. Please be sure to check out my Meatloaf Muffin Tins and Cheesey Potatoes recipe that is inspired by this farm tour! Disclosure: This trip and my expenses were paid for by Best Food Facts and all opinions are my own. Like to set up a tour at your place for a Girl Scout and Homeschool group. Please contact New Hope directly, they won't see it here. Fabulous recap post! Loved reading all this info again since it was hard for me to absorb it all while touring! Looking forward to seeing you at the end of the month! Thanks, Lynn! I had to consult with Krista to make sure what I "remembered" was accurate! 😉 See you in a few weeks! 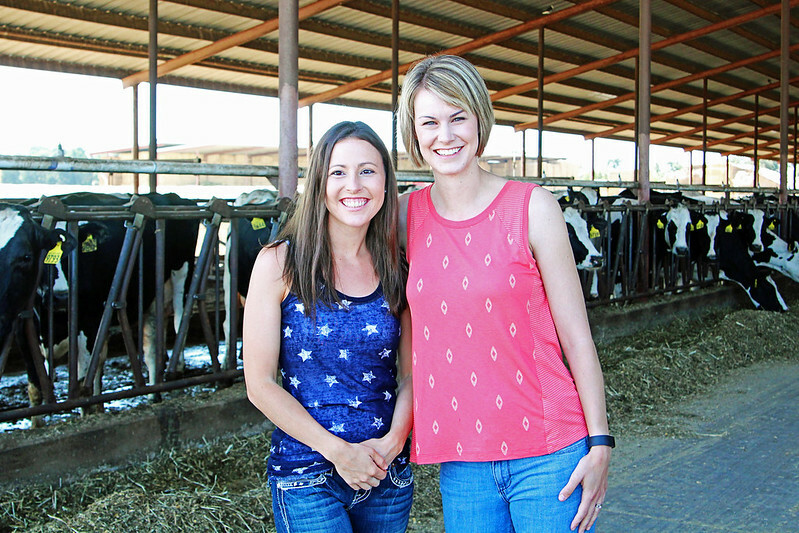 Sarah – What a fantastic recap of our time at New Hope Dairy! I love the group pic! Very fun to relive New Hope Dairy through this post, Sarah – such great picts! Great post, Sarah it was very nice getting to meet you during this tour with Best Food Facts, a lot to learn from you! Great to meet you and I hope you'll be in Chicago, Adriana! I really enjoyed your post about New Hope too!